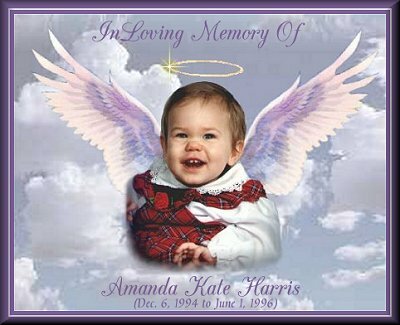 This page is dedicated to Amanda Kate Harris, she is our daughter. Amanda was born on 12-6-94 and she was diagnosed with Spinal Muscular Atrophy I at 7 months old. She was a very happy baby and the apple of our eyes, she was the light of my life. She passed away on 6-1-96 just 5 days short of 18 months. She loved music, and people. She had the most beautiful smile, and she would always have one ready for you. Amanda's granddaddy, Dean Harris, joined her in Heaven suddenly on Oct. 13, 1997. He had a massive heart attack on the way home from his hunting land. He had been building his tree stand that day. He was 56 years old, and he was never sick a day in his life. It was a total shock, and he is missed and loved very much by us all. Amanda's little brother also joined her in heaven, on Dec. 2, 1997. I was 14 weeks pregnant when we lost him, to SMA, just like Amanda. Although I never got to meet him and hold him, I wanted him and love him very much. Justin Dean Harris was born on Sept. 18, 1999. Amanda now has a SMA FREE baby brother!!!! Click here to meet Justin. Check out links below to read all about Amanda and to see her pictures. Don't forget to go to the poetry page, and be sure to read Nana's Letter to Amanda. A special thanks to Dawn for making Amanda's Angel Memorial at the top of this page. A special thanks to Callen for making Amanda's Welcome Banner, and the background for this page.